Not an extensive trail at all. Just a 1.5 km loop with a great honkin’ big old rock that some glacier left behind a long time ago. There’s a trail (0.6 kms return) off from the boulder which ends by intercepting “The Lower Trent Trail”. This former railway bed runs for 17 kms from Trenton to the town of Glen Ross. Finding the driveway into Bleasdell Boulder C.A. can be challenging. As you cruise North on Hwy 33 from the 401 at Trenton, it’s on your left just before you get to the first bridge you’ll see crossing the river. There’s a Conservation Area sign, but it doesn’t give you much of a heads-up as it’s almost directly across from the road in. *** UPDATE – Sept 9, 2017 – They’ve erected new honkin’ big old signs from the North and South now. There’s ample parking with a port-a-potty in the season. The trails are wide enough for three to walk side-by-side, gravelled, and fairly level. The boulder is a little less than halfway around the loop trail. The loop continues going to the left of the boulder. If you follow the trail to the right (past the front of the boulder), you’ll run into the “Lower Trent Trail”. We only walked a short way to the North (right turn from Bleasdell trail) and found a lovely bridge over an equally beautiful stream. We returned later, to walk this trail on it’s own. The link to that review is in the first paragraph of this review. This trail is gravelled, quite level, and wide. The din of the 401 is faintly evident throughout most of it. 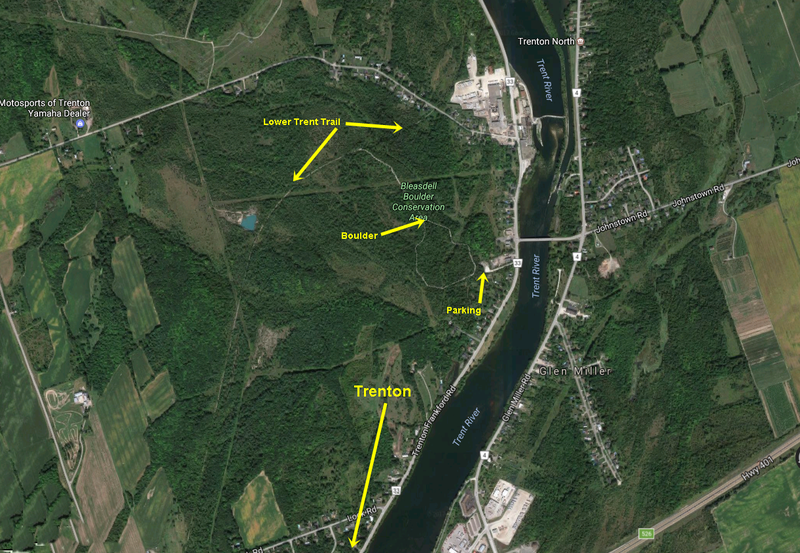 The exception being the trail leading down to the Lower Trent Trail, and the Lower Trent Trail itself. We sighted a fair variety of wildflowers and wildlife on our short walk. It’s well maintained, and very clean. A pleasant little stroll only twenty minutes drive from Sidney Conservation Area if you’re itching for more trails. There’s no charge for parking or use, and with the exception of the portable washroom, there are no facilities on the trail nor in the parking lot.